Welcome to one of the country's most delightful surprises. No longer the dirty steel town of old, Pittsburgh is now a true renaissance city. A city of modern cathedrals and Old World, neighborly charms, filled with high-tech companies, friendly faces, fun, and adventure. Come and take a closer look! Pittsburgh was the first city in the world to do a lot of neat things! Here are a few of the most well-known. First Heart, Liver, Kidney Transplant (December 3, 1989): The first simultaneous heart, liver and kidney transplant was done at Presbyterian-University Hospital. The First Internet Emoticon (1982): The Smiley :-) was the first Internet emoticon, created by Carnegie Mellon University computer scientist Scott Fahlman. First Robotics Institute (1979): The Robotics Institute at Carnegie Mellon University was established to conduct basic and applied research in robotics technologies relevant to industrial and societal tasks. First Mr. Yuk Sticker (1971): Mr. Yuk was created at the Poison Center at Children's Hospital of Pittsburgh after research indicated that the skull and crossbones previously used to identify poisons had little meaning to children who equate the symbol with exciting things like pirates and adventure. First Night World Series Game (1971): Game 4 of the 1971 World Series was the first night game in World Series history, a series that Pittsburgh went on to win, 4 games to 3. First Big Mac (1967): Created by Jim Delligatti at his Uniontown McDonald's, the Big Mac debuted and was test marketed in three other Pittsburgh-area McDonald's restaurants in 1967. By 1968 it was a mainstay on McDonald's menus throughout the country. First Pull-Tab on Cans (1962): The pull-tab was developed by Alcoa and was first used by Iron City Brewery in 1962. For many years, pull-tabs were only used in this area. First Retractable Dome (September 1961): Pittsburgh's Civic Arena boasts the world's first auditorium with a retractable roof. First Polio Vaccine (March 26, 1953): The polio vaccine was developed by Dr. Jonas E. Salk, a 38-year-old University of Pittsburgh researcher and professor. First All-Aluminum Building - ALCOA (August 1953): The first aluminum-faced skyscraper was the Alcoa Building, a 30-story, 410-foot structure with thin stamped aluminum panels forming the exterior walls. First Zippo Lighter (1932): George G. Blaisdell invented the Zippo lighter in 1932 in Bradford, Pennsylvania. The name Zippo was chosen by Blaisdell because he liked the sound of the word "zipper" - which was patented around the same time in nearby Meadville, PA.
First Bingo Game (early 1920's): Hugh J. Ward first came up with the concept of bingo in Pittsburgh and began running the game at carnivals in the early 1920s, taking it nationwide in 1924. He secured a copyright on the game and wrote a book of Bingo rules in 1933. First U.S. Commercial Radio Station (November 2, 1920): Dr. Frank Conrad, assistant chief engineer of Westinghouse Electric, first constructed a transmitter and installed it in a garage near his home in Wilkinsburg in 1916. The station was licensed as 8XK. At 6 p.m. on Nov. 2, 1920, 8KX became KDKA Radio and began broadcasting at 100 watts from a make-shift shack atop one of the Westinghouse manufacturing buildings in East Pittsburgh. Daylight Savings Time (March 18, 1919): A Pittsburgh city councilman during the first World War, Robert Garland devised the nation's first daylight savings plan, instituted in 1918. The First Gas Station (December 1913): In 1913 the first automobile service station, built by Gulf Refining Company, opened in Pittsburgh at Baum Boulevard and St. Clair Street in East Liberty. Designed by J. H. Giesey. The First Baseball Stadium in the U.S. (1909): In 1909 the first baseball stadium, Forbes Field, was built in Pittsburgh, followed soon by similar stadiums in Chicago, Cleveland, Boston, and New York. First Motion Picture Theatre (1905): The first theater in the world devoted to the exhibition of motion pictures was the "Nickelodeon," opened by Harry Davis on Smithfield Street in Pittsburgh. First Banana Split (1904): Invented by Dr. David Strickler, a pharmacist, at Strickler's Drug Store in Latrobe, Pennsylvania. The First World Series (1903): The Boston Pilgrims defeated the Pittsburgh Pirates five games to three in baseball's first modern World Series in 1903. First Ferris Wheel (1892/1893): Invented by Pittsburgh native and civil engineer, George Washington Gale Ferris (1859-1896), the first Ferris Wheel was in operation at the World's Fair in Chicago. It was over 264 feet high and was capable of carrying more than 2,000 passengers at a time. Long-Distance Electricity (1885): Westinghouse Electric developed alternating current, allowing long-distance transmission of electricity for the first time. First Air Brake (1869): The first practical air brake for railroads was invented by George Westinghouse in the 1860s and patented in 1869. 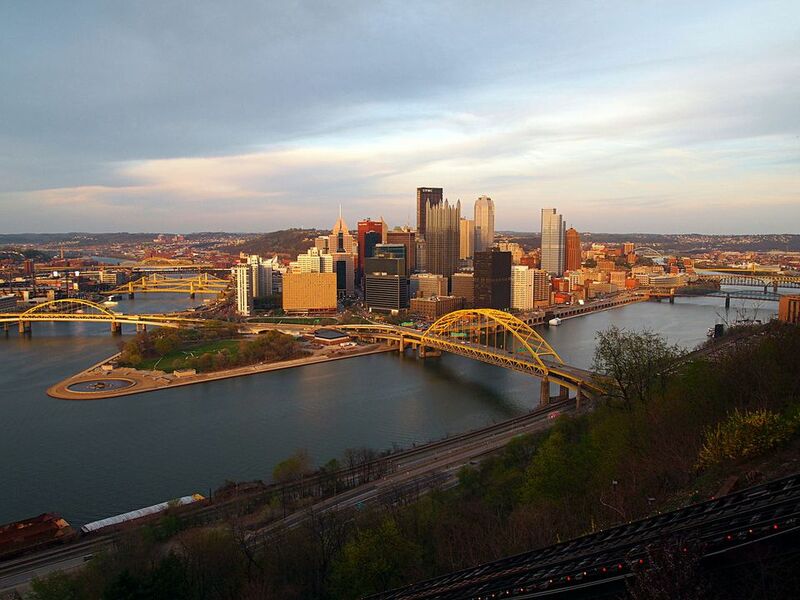 Pittsburgh was named in 1758, incorporated as a borough in 1794 and chartered as a city in 1816. Pittsburgh audiences enjoy the nation's fifth oldest opera company. Pittsburgh ranked in the top five Most Livable Cities in the 1983, 1989 and 1985 editions of the "Places Rated Almanac." The Carnegie Museum of Art opened in 1895 as the world's first museum of modern art. Mister Rogers' real neighborhood was Oakland, home to WQED (the first public television in the country) and the "Neighborhood of Make Believe." Pittsburgh lost the "h" in its spelling in 1891, but after 20 years of protest, the U.S. Board on Geographic Names relented and the "h" was restored.